Looking for that touch of class? eZips are perfect for alfresco areas, pergola’s and veranda’s as they suit both narrow and wide openings. A fully enclosed Colourbond head box provides a neat finish to your outdoor area. eZip is built to handle strong winds. The fabric locks into the side tracks making it impossible for to blow out and the construction is finished off with heavy duty side tracks and a heavy duty bottom rail. Choose from our Sunscreen fabrics with a large range of modern colours or opt for the PVC fabrics available in either clear or tint. We offer the choice of either, manual, crank or motorised operation (using Somfy motors). Available in 5 modern colours with the option of custom powder coating, the eZip will add a touch of class to your outdoor area and allow protection from the sun, wind and rain all year round. 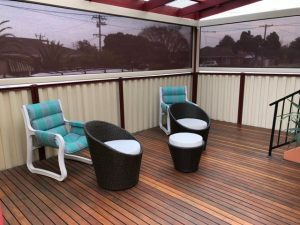 Colourbond Slimline head box, heavy duty side tracks & bottom rail are the key features the ensure our “eZips” are ideally suited for strong winds to create an indoor/outdoor entertaining area that can be used all year round. Also available is a wide range of materials which give protection from the sun and still allow a breeze to pass through. Now we truly offer full protection all year round. For ease and simplicity, motorise your blinds. (with Somfy motors) All motorised blinds are professionally wired by our “A” grade electrician and come with a certification that is your guarantee that all workmanship complies with Australian standards.